During my many years of involvement with Full Tilt Print Studio I have had the opportunity to both help plan for its future as well as deal with the problems challenging its continued existence. 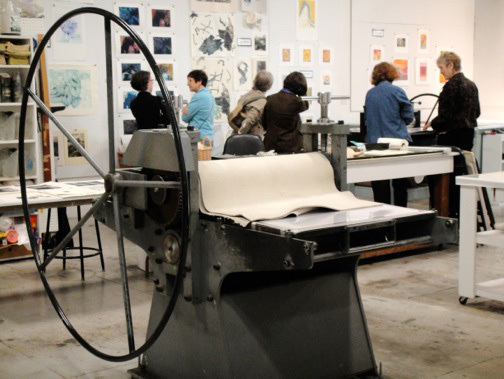 Experimental Etching Studio was founded in 1970 by Deborah Cornell and Jeannette Silverio. Located on Stanhope Street, Boston, it was a workshop where artists could pay by the day to do their work, as well as take classes in printmaking. 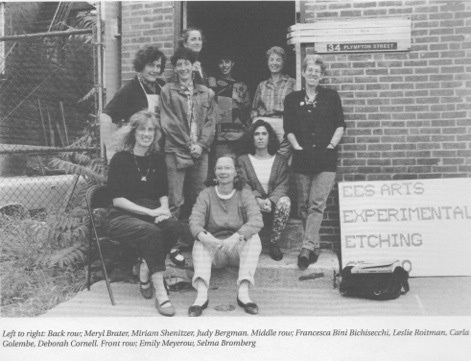 In 1983, the studio’s name was changed to EES Arts, Inc., reflecting its new status as a closed cooperative group of 25 artists. In 1988, we received an eviction notice from the landlord giving us 30 days to vacate the premises. After a brief, frantic search we found a new home for the studio in a first floor loft on Plympton Street, in Boston’s South End neighborhood. Obviously, being part of a cooperative print studio has both advantages and challenges. 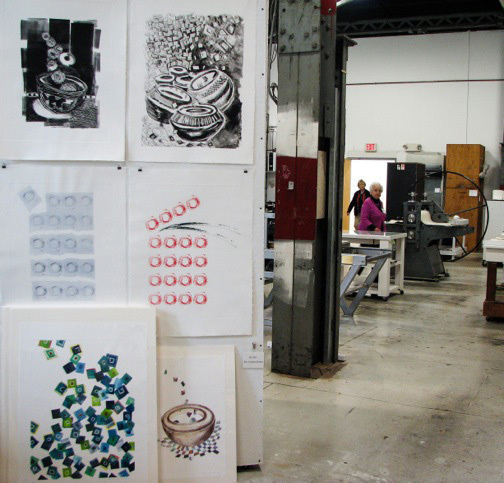 It is a joy to work in a well-equipped workshop among a community of professional artists who share one’s love of printmaking. A few years after becoming a cooperative, we embarked on the first of our collaborative portfolio projects, titled EES ARTS. Approximately every five years we would publish another portfolio, each very different in theme and format. Originally conceived as a way to exhibit the work of the group, the portfolios have also been a means of raising capital. They are in the permanent collections of the Boston Public Library, the Art Complex Museum in Duxbury, MA, the Worcester Art Museum and Wheaton College, as well as private collections. This communal aspect of the studio is one of its great strengths. But there are many challenges, including keeping the costs within budget while maintaining the equipment and space. But the fact that our membership dues have not increased in 25 years is a tribute to how well the cooperative concept can work. Yet belonging to a cooperative is not for everyone. Over the years, many artists have joined, stayed for a while and then moved on, but there is still a core group of people who have remained members throughout the studio’s existence. In May, 2001, reflecting the ongoing gentrification of the South End, our landlord doubled the rent, and once again we were in search of a new space. This time it took longer. We heard about the Humphreys Street Studio, in Dorchester, which was in the process of being developed, and tentatively reserved a 1500 square foot space in the building. It was the former Daloz dry cleaning plant, and although assurances were made that the toxic chemicals had been cleaned up, we were very concerned. And then, one of our members, Constance Jacobson, told us about her new painting studio located in a former train repair facility on Sprague Street in Hyde Park. The landlord was planning a new buildout on the second floor where the artists’ studios were. We investigated, liked the location better than Humphreys Street, and decided to lease one bay in this huge building. We moved out of Plympton Street over the summer, put the equipment in storage, and waited. As it turned out, the landlord never did build out the new space, but a much larger space on the same floor became available in the fall. We signed a lease and moved in October. In another transition decided upon just before we moved, the group sought non-profit status. With the help of our president, Shirley Levy, we accomplished this goal within a year. Of course our uncertain situation had taken its toll on our membership, and we lost around 20 percent. Fortunately, we raised some funds by selling a few print portfolios to members, so we were able to underwrite the expense of moving the studio and storing the equipment. Once settled in the space, its central location attracted new members and it didn’t take long for us to get back to sound financial footing. The 2700 square foot studio is filled with light and has 35 foot ceilings. It is much more space than we thought we needed, but there was room not only for new presses, but also a photopolymer dark room. And every time I enter the space I am so thankful it is ours! In order to prosper in the internet age, many members felt it was time for a new name, something more descriptive of the studio’s character. So, in 2013, we became Full Tilt Print Studio. We continue to publish portfolios, and our two latest, Lighten Up and SUB ROSA will be exhibited at the Art Complex Museum in Duxbury in November of this year. It is hard to believe more than 45 years have passed since the studio first opened its doors. It continues to be a vibrant and creative place for it members.